Hazel Bedwell Johnson, 78, of Bellevue, passed away Monday, November 12, 2018 at University of Mississippi Medical Center in Jackson. Visitation will be Monday, November 19, 2018 at Bellevue Baptist Church from 10:30 – 11:30 a.m. with services immediately following at 11:30 a.m. Burial will be in Bellvue Baptist Church Cemetery. She was a member of Bellevue Baptist Church and a homemaker. 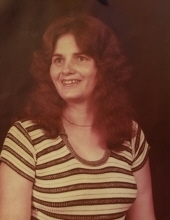 She was preceded in death by her husband, Jeral Johnson; one son, Jerry Eugene Johnson; four grandchildren, Shaina Johnson, Travis O’Neal Johnson, Mark Kuhlmann and Shaina Nicole Kuhlmann; and one great-grandson, Adam Wayne Kuhlmann. She is survived by two sons, John Paul Johnson of Bellvue and Justin O’Neal Johnson of Seminary; two daughters, Judy Ann Jackson of Bellvue and Jeanie Carnell Kuhlmann of Moselle; 16 grandchildren and 22 great grandchildren; one brother, James Ray Bedwell of Midway; and two sisters, Brenda Miller of Biloxi and Patricia Boyd of Bellvue. To send flowers or a remembrance gift to the family of Hazel Bedwell Johnson, please visit our Tribute Store. "Email Address" would like to share the life celebration of Hazel Bedwell Johnson. Click on the "link" to go to share a favorite memory or leave a condolence message for the family.